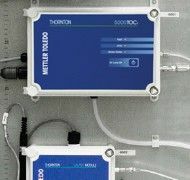 The 5000TOCi sensor is a user-friendly and economical analyzer for on-line measurement of total organic carbon. 5000TOCi uses proven ultraviolet (UV) oxidation with differential conductivity to effectively determine TOC concentrations. Fast, continuous TOC monitoring ensures rapid detection of even brief upsets to demonstrate compliance with water quality requirements in real-time. 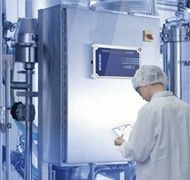 Meets the requirements of all major global pharmacopeias for TOC instrumentation, including USP, EP, JP, ChP, and IP. "Detection of TOC concentrations from ppm to sub-ppb range enables comprehensive trending to diagnose issues that can affect water system performance." Enclosure Material "Polycarbonate plastic, flame retardant, UV and chemical resistant UL # E75645, Vol.1, Set 2, CSA #LR 49336"
Any TOC excursion can potentially lead to a production or compliance issue, so the 5000TOCi gives you clear and costant visibility into your water system's TOC levels. The 5000TOCi is the reliable choice for pharmaceutical and microelectronics water systems. Providing simplicity in addition to compliance, the 5000TOCi on-line TOC analyzer has no moving parts or reagents. Fewer moving parts reduces the likelihood of sensor failure, and reduces the need for unplanned maintenance. 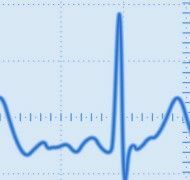 Have confidence in your measurement accuracy with reliable, continuous, real-time TOC analysis. The on-line 5000TOCi sensor is equipped with automated flow control capability that eliminates sensitivity to pressure changes in water systems. This Application Note explains why total organic carbon (TOC) has been identified as an important measurement in power plant chemistry. 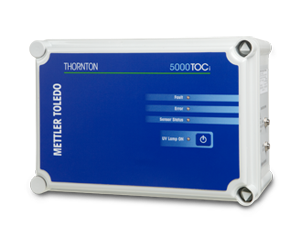 The 5000TOCi Total Organic Carbon Sensor with ISM from METTLER TOLEDO Thornton delivers the power of an analyzer with the convenience of a sensor. The UV lamp and filter should be replaced every 4,500 hours of operation. Full calibration provided to maximize measurement accuracy and productive uptime. If your application operates under the US Pharmacopeia a System Suitability Test will be performed. It provides evidence that system performance is adequate for TOC analysis and meets compliance requirements.